NEWPORT NEWS, Va., Oct. 20, 2005 (PRIMEZONE) -- Northrop Grumman Corporation (NYSE:NOC) has selected Federal Equipment Company to design and build the advanced weapons elevator for the new-generation aircraft carrier, CVN 21. Northrop Grumman's Newport News sector awarded the approximately $50 million contract following a year-long design competition. During this period, vendors refined their designs and built and tested a full-scale, one-quarter load elevator drive. 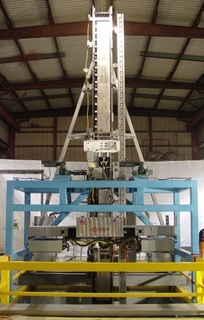 The preliminary design competition concluded in early 2005, and Federal Equipment Company and their technology partner, MagneMotion, were chosen to develop a full-scale prototype elevator for land-based testing. Prototype testing will be completed by late 2007, and they will begin to manufacture the production units, which are scheduled for shipboard installation in mid-2010. "We've been pleased with the preliminary design and testing of this new system which is a vital component to enhancing flight-deck operations," said Mike Shawcross, vice president for the CVN 21 Program at Northrop Grumman Newport News. "As we continue to work with our design partners to transition this concept into reality, we come one step closer to bringing the CVN 21 to life." Innovations for the CVN 21 program include an enhanced flight deck capable of increased sortie rates and improved weapons movement. An essential part of achieving these goals includes the incorporation of an advanced weapons elevator. The new elevator operates by a permanent magnet linear synchronous motor, eliminating the need for wire ropes, and making it faster and capable of holding more than double the capacity of the Nimitz-class design. Federal Equipment Company specializes in the design, manufacture and installation of conveyors, elevator platforms, dumbwaiters and shipboard helicopter hangar equipment for the U.S. Navy. MagneMotion develops and manufactures assembly automation, material handling and transportation solutions using electro-magnetic technology and linear synchronous motor and magnetic levitation systems. The advanced weapons elevator prototype for Northrop Grumman's future-generation aircraft carrier, CVN 21.